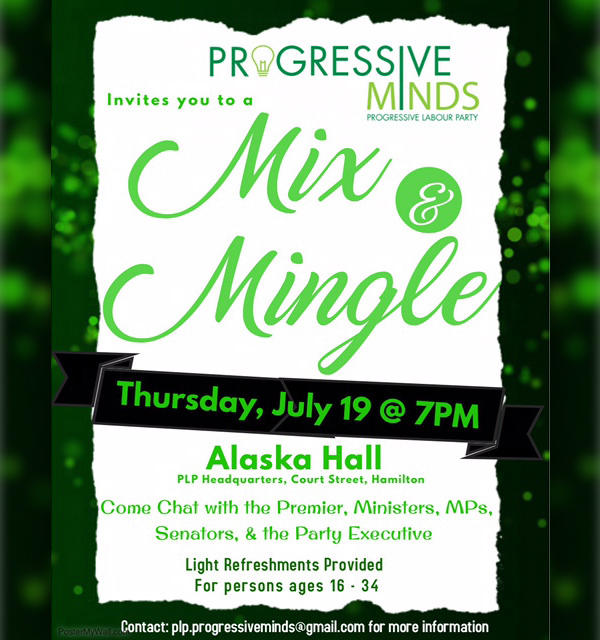 Progressive Minds, the youth wing of the PLP, invites young people from ages 16-34 to a ‘Mix & Mingle’ this coming Thursday. “This event, to be held on Thursday, July 19, at 7pm, will be at PLP Headquarters, Alaska Hall, Court Street, Hamilton, and will have in attendance the Premier, Cabinet Ministers, Members of Parliament, Senators, and members of the Party Executive. “We are a year into this term, and we wanted to take this opportunity to meet with these young folks, who have very definite views on life in Bermuda, and what they would like to see. We want the feedback, positive and negative, and we want to know what they are thinking so that we can best serve them. So we are inviting the young people out to bend our ears and to chat with us,” stated Premier and PLP Party Leader David Burt. Light refreshments will be provided and young people can contact plp.progressiveminds@gmail.com for additional information.